November Rain Ponchos come in several colors and patterns, with a matching drawstring pouch. The humble waterproof poncho, for generations thrown over heads in a downpour, has never been what you might call stylish. But now, thanks to a fashion makeover, what was once a cheap swath of thin dull plastic, prone to tearing to death in not much time under normal use, has been reborn as the bright, swingy, and supremely sturdy November Rain Poncho. It's still waterproof and you can still throw it over your head (though you don't have to thanks to a full-length front zipper). 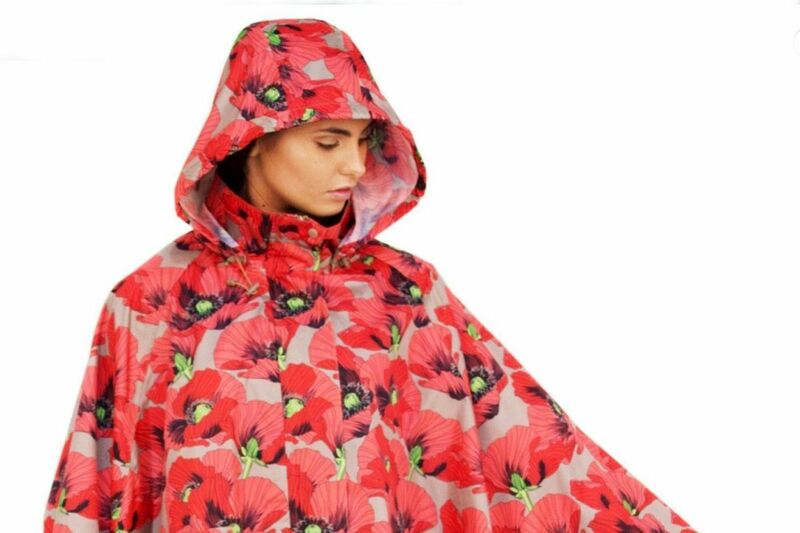 But behold the bright red poppy blooms, whimsical silver and gray vines, and bold geometric patterns printed onto the satiny polyester fabric. Bonded to the fabric's lightweight waterproof PVC backing, a layer of soft polyester spares your body from the feel of rubber. Heat-sealed seams keep out leaks. Did we mention the detachable snap-on matching hood, the spacious flap-covered front patch pocket, and the snaps at the wrists that let you create a kind of sleeve when you want a bit more structure? Each poncho weighs about a pound and stashes in an included 8-inch by 5-inch matching drawstring pouch. November Rain Waterproof Poncho, in a range of patterns and solid colors in one unisex size, is $59 at www.novemberrain.co.